This is basically a #BucketList post, wherein I share one of the items that I have ticked off of my own list. Sky Diving is on 90% of the world's population's Bucket List. Not everyone gets to tick it off, though. I'm very glad I did. Fair Warning: Some photos may be disturbing. Sky diving, which makes you travel a million or so miles an hour, make your skin floppy and flabby, mostly on the face, and they make for very RAW and RIVETING photos. My ship goes to the island of Kauai every Thursday and Friday. They call this the Honeymoon Island... Others say it's the Adventure Island. Well, I call it, Grocery Day! Because we've got Kmart and Walmart shuttles waiting for us outside our ship, that run every 15 to 20 minutes! Yippee! Anyway... Michelle (my boss) and I, booked ourselves to go skydiving at Sky Dive Kauai to celebrate our birthdays. My birthday was in March, hers was in May, we figured that was as good a time as any to do a joint birthday celebration jump! It doesn't make sense, but hey... We went out there and did something! You seriously do. 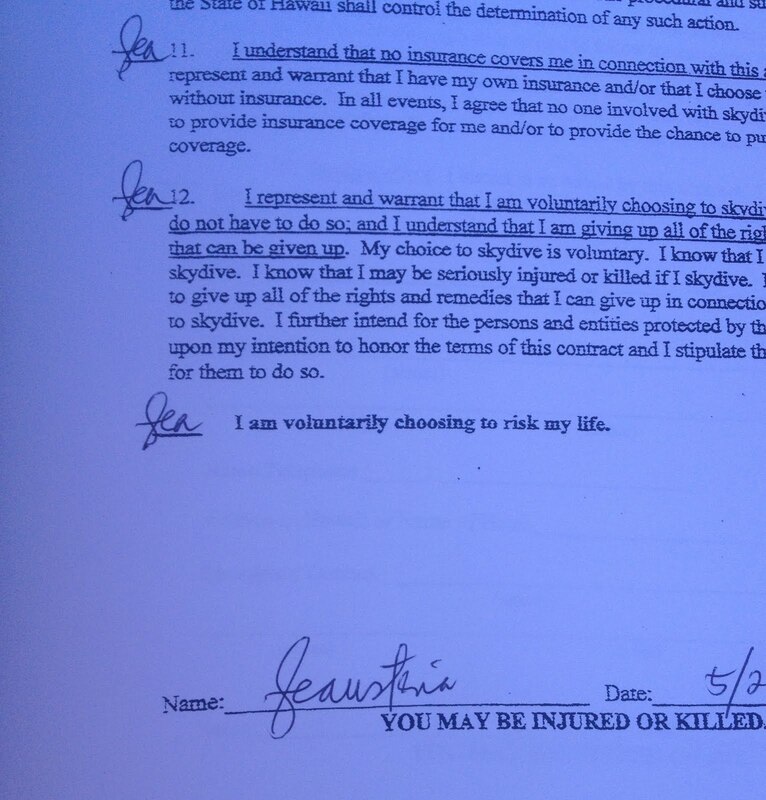 When you get there, you have to sign a waiver that literally says - "You could be killed"... AND sign a statement that says, "I am voluntarily choosing to risk my life." But... We all die in the end, anyway. 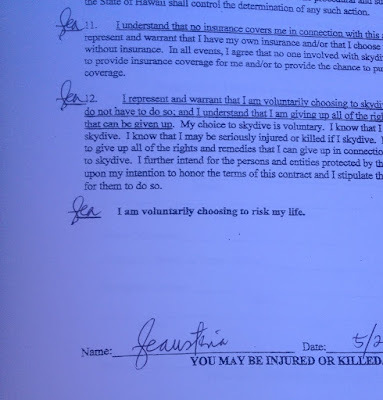 And I figured... if I died jumping out of a plane, *flying*, like I've always dreamed of doing since I was a child, it wouldn't be too bad. And so we got ourselves strapped and ready to go! It looked like it was severely injured and bandaged. Not really sure how I felt upon laying my eyes on that. Luckily, the instructors were kidding... And directed us to an equally small - but better looking plane. 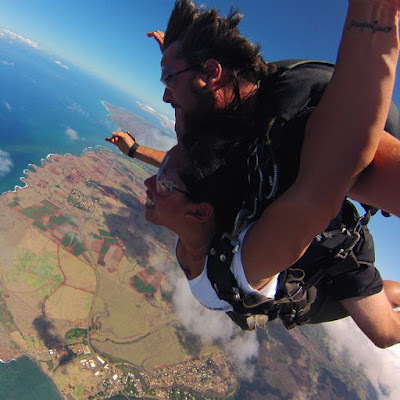 So basically, all four of us (Michelle and both our instructors) were going to squeeze into that little thing --- WHICH DID NOT HAVE A DOOR, I'd like to add... and the pilot was gonna take us up, give us a little areal view of Kauai, and then just dump us out! Simple! There were no chairs, so we were all just seated nice and snug on the floor. Michelle was having a blast and was looking very cozy with her man. I was already screaming, and we hadn't even took off yet. We went up and the pilot sort of took his time hovering around Kauai to give us a really nice view of the island from above. It's really pretty... But to be honest, I was NOT digging the whole foreplay thing. I did mention that the plane did not have a door, right? So I was growing anxious of what was about to come, and delaying the inevitable was killing me. I was getting more and more nervous, I could NOT enjoy the view, no matter how gorgeous the day was... I kept thinking about the jump, and having to jump out, and the possibility of plummeting down to my inevitable death. "Can we just jump??" I yelled to my instructor. "Let's just GO! Let's get it over with!" I screamed. He laughed, and said, "OK! Almost there!" The pilot took us above the clouds, and got ready, as WE got ready. I volunteered early on to jump first. Not because of bravery... but because I knew I was going to get even MORE anxious or nervous if I were to witness Michelle jump out of the plane first, and then wait for her to get to a certain height before I could jump out. No way. I'd rather get it over with first. I don't do very well with anticipation, and I am not a very patient woman. We started to position ourselves by the (nonexistent) door. You will notice that I am leaning my head up against my instructor's shoulder. No - I wasn't trying to be cute. I could NOT look Down. NOT FOR THE LIFE OF ME. I couldn't look down. If I could have jumped out lying face up like a pancake, I would have. I am not afraid of heights but it's the ANTICIPATION. I was VERY nervous, and if I looked down, I would have had thoughts of backing out - and it was out of the question. So I just kept my head up, and let my instructor count off! As soon as he said, "READY??" I am very happy to announce that you, in fact, do NOT get that gross navel jolt feeling. Not at all. It is, what I imagine, SUPERMAN feels when he flies. Pure and utter bliss. I was still screaming - but not out of fear anymore... It was exhilaration and joy. So, you know that scene in Superman... when he takes Lois Lane up to fly with him for the first time, and the song, "Can You Read My Mind" plays? Well.... THIS. I mean, you only free fall for about 10 - 15 seconds (possibly even less)... but those moments are what you remember, because it's what renders the most intense feelings of happiness. It is fleeting... but totally, TOTALLY worth it. Before I knew it - he pulled the parachute, and BEUFFFFF! It was like we were suspended in time and space, and we lost gravity. And then it was just - nice. My instructor let me drive for a minute to let me feel what it's like to take control of the chute... It was great - but it takes a little getting used to. And then we made our descent. 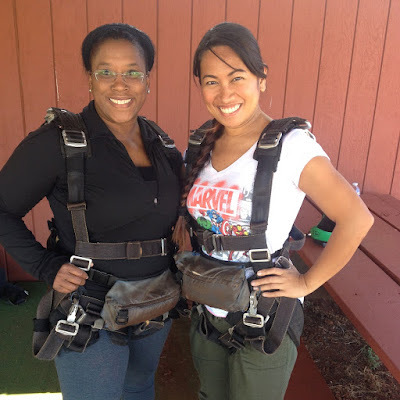 My instructor and I had a PERFECT landing, planting all four feet firmly on the ground... That is, before my knees buckled from the relief of BEING ALIVE!!!! You will literally scream - "I'm Alive! I'm Alive" after going through all that. Honestly, the wave of relief that swept over me made me realize that I really DID think that there was a huge possibility of me dying! And then I got over it, and posed in front of my parachute. Michelle and I ran in for a big hug when we were both on the ground, congratulating each other for not dying! It was AH-MAY-ZING!!! And honestly - I cannot wait to do it again! The worst part is letting go --- as it always is, in life. Really - it's the jump. Or the idea of jumping out of the plane. Once you get over that little hurdle - everything is illuminated... Everything that you experience from then on is just beauty... and madness... and euphoria... and love. There is no pain. Only fun. I promise! One final selfie with my instructor, and back to the ship we went.